So North London remains red after Arsenal put Spurs to the sword with a scintillating comeback in a memorable derby. This was a performance to give hope to the club’s long-suffering supporters, who have endured a troubled season to date, as the Gunners have misfired on all too many occasions. There is still much to play for, as the victory over their neighbours took Arsenal back into the top four, so they still have a chance of maintaining their remarkable record of qualifying for the Champions League for 14 consecutive seasons. However, barring a miraculous comeback against Milan in the last 16 of that tournament, it will be the seventh year without a trophy – a poor return for a club of Arsenal’s plentiful resources. Although there have been signs of promise, it is fair to say that overall this has been one of the worst seasons in recent memory for Arsenal. Eliminated from the Carling Cup by Manchester City and (less understandably) from the FA Cup by Sunderland, they are currently a massive 17 points behind the leaders in the Premier League and (whispers) seven points behind Spurs. They have already suffered eight defeats in the league, most painfully a humiliating 8-2 drubbing by Manchester United, but also including losses to lesser lights like Blackburn Rovers, Fulham and Swansea. The inconsistency has been maddening, because at times they have demonstrated their potential, notably during a thrilling 5-3 away win against Chelsea and a 7-1 demolition of Blackburn in the return match. Much of the blame for the uneven displays can be laid at the feet of last summer’s activity in the transfer market, when they lost two of the club’s best players, Cesc Fàbregas and Samir Nasri, and replaced them with inferior talents. The problem was exacerbated by the protracted discussion around these movements, so that the numerous arrivals in the latter stages of the transfer window resembled football’s version of a supermarket sweep, rather than any form of coherent strategy. Even though the likes of Mikel Arteta, Yossi Benayoun, Per Mertesacker, Gervinho, André Santos have all had their moments, none of the new purchases are really the type of player to take Arsenal to the next level – with the possible exception of the gifted Alex Oxlade-Chamberlain, who is one for the future. Certainly, they do not raise the pulse rate like Mario Götze, Eden Hazard or Juan Mata, who were all mentioned in dispatches as possible buys. Even Arsène Wenger admitted that last summer was one of his worst periods as a manager with his plans badly affected by players leaving for the first time just as they were reaching maturity, though he argued that some of the last minute buys were also necessary due to the injuries suffered by Jack Wilshere, Thomas Vermaelen, Abou Diaby and Kieron Gibbs (though the latter two could hardly have come as a great surprise). Despite all the new signings, Arsenal yet again managed to make money on the transfer comings and goings, something that is difficult for most fans to understand, given the strength of the balance sheet. As they see it, while the squad weakens, the club’s finances continue to prosper. Worse than that, the executive management seem to be in a state of denial, as shown when chief executive Ivan Gazidis claimed that Manchester City would love to be in Arsenal’s position. This seemed a foolish pronouncement at the time, but Gazidis must have cringed as the reversals at Milan and Sunderland nailed that bizarre claim in a few short days. Eyebrows were further raised when the club proudly announced a thumping great profit of £49.5m for the interim accounts (covering the six months up to 30 November 2011), which was £55.6 million better than the £6.1 million loss reported a year ago, though all of the improvement was effectively due to the significantly higher profit on player sales, which increased by £59 million from £4 million to £63 million (primarily Fàbregas, Nasri and Gaël Clichy). Although turnover from football was up an impressive 16% (or £16 million) from £98 million to £114 million, this growth was eaten up by an increase in squad investment with wages up £8 million and player amortisation £7 million higher. As anticipated, there was a slow-down in the property business, where revenue dropped £19 million to £3 million, though the reduction in profit was much smaller – from £3.3 million to £0.6 million. It should be noted that much of the revenue growth is down to timing, e.g. the increase in match day revenue is mainly due to four more home games being played than the same period last year. Assuming that Milan complete the Italian job in the Champions League, then the difference for the full year will be only one match. Furthermore, not all of a football club’s business is evenly phased, so half-year results can be a little misleading. That is why much of the rest of this analysis will rely on the annual trends to glean some insight into what is happening at Arsenal. What we can say is that these excellent half-year results continued a record of financial success that is the envy of most other club chairman. Even though the annual profit before tax fell from an amazing £56 million in 2010 to £15 million in 2011, that is still a very impressive figure for a football club. 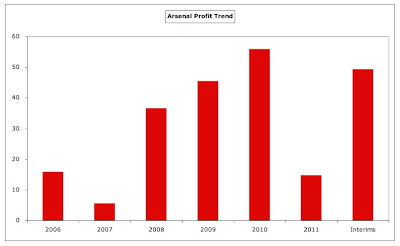 Arsenal’s expertise can be evidenced by two great statistics: (a) the last time that they reported a loss was way back in 2002; (b) in the last four years alone, they have accumulated staggering profits of £153 million. This sort of business prowess is very much the exception to the norm in the highly demanding world of football, e.g. 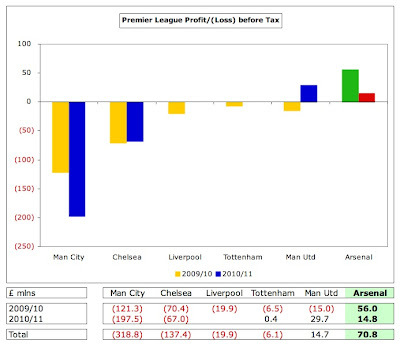 in 2010 only four clubs in the Premier League were profitable. However, Arsenal’s willingness to swim against the tide is perhaps best shown by comparing their financials against the leading clubs over the last two seasons. At one end of the spectrum, we have Arsenal’s £71 million of profits, which is in stark contrast to the enormous losses at Manchester City (£319 million) and Chelsea (£137 million). Liverpool have not yet reported for 2011, but made a notable loss of £20 million in 2010, while even the fiscally prudent Tottenham registered losses of £6 million. Only Manchester United joined Arsenal in being profitable, as their ability to generate cash more than compensated for their hefty interest payments in 2011 (though they still made a loss in 2010). All well and good so far, but this is by no means the whole story at Arsenal, as their profits have been very reliant on property development and player sales. In these interims, there was little impact from property development, but without the £63 million profit on player sales, the football club would actually have made a sizeable loss of £14 million, including an operating loss of £7 million. In the annual results for 2011, property played a larger role, providing the vast majority (£13 million) of the total £15 million profit with only £2 million coming from the football business. Furthermore, if the £6.3 million made from player sales is excluded, the club made a £4 million loss in the football segment. Even the enormous £56 million 2010 profit would only have been £7 million without £11 million property gains and £38 million player sales. This is concerning, as property gains will come to an end at some stage, while Arsenal would not wish to be seen as a selling club, even though this has been a major reason for their recent profits, e.g. £94 million (or over 60%) of the £153 million made in the last four years. That’s good business, but it makes it hard to build a winning team. Although the property development at Highbury Square has not proved to be as lucrative as originally hoped, due to the market crash, it has generated money for the football club. This peaked in 2010, when revenue was boosted to the tune of £157 million, though the profit contributed was “only” £11 million. Only a few apartments still remain to be sold, but there are other substantial developments at Queensland Road, Hornsey Road and Holloway Road, which should deliver additional cash, as noted by Gazidis, “Our property business is debt-free, so any new sales of property do accumulate cash, which is very positive for the future.” This could be worth up to £35 million according to an estimate made by the respected Arsenal Supporters’ Trust (AST), though is only likely to be booked in the 2012/13 accounts at the earliest. So, to cut a long story short (as Spandau Ballet once said), Arsenal's financial performance has undoubtedly been impressive, especially compared to almost every other football club, but they face more challenges than would seem apparent on first glance. 1. Where will the revenue growth come from? 2. What happens if Arsenal fail to qualify for the Champions League? 3. How much is Arsenal’s transfer budget? 4. How can the wage bill be so large? 5. Where has all the money gone? 1. Where will revenue growth come from? 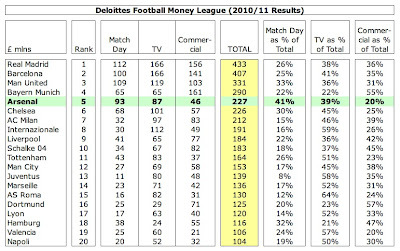 On the face of it, Arsenal do not have a revenue problem, as they enjoy the fifth highest revenue in Europe according to the Deloitte Money League. In England, it is only surpassed by Manchester United’s £331 million and is way ahead of Liverpool £184 million, Tottenham £164 million and Manchester City £153 million. However, the problem is that the gap to the top four clubs is widening, though that is partly due to exchange rate movements. The Spanish giants, Real Madrid and Barcelona, generate around £200 million more than Arsenal at £433 million and £407 million respectively. Similarly, Manchester United earn over £100 million more with £331 million, while Bayern Munich’s revenue of £290 million is a handy £60 million higher. It’s difficult to compete with these clubs with such a financial disadvantage, especially if you consider that they receive the benefit of that substantial additional revenue every single season. The reality is that Arsenal’s revenue has been essentially flat over the last three seasons at around £225 million, while other clubs continue to grow their business. In that period, Manchester United, Tottenham and Manchester City have all added more than £50 million income, while Chelsea have also earned an additional £19 million. Of the top six, the only club to have under-performed like Arsenal is Liverpool – and even they have actually delivered impressive commercial gains to compensate for the loss of Champions League football. Why does this matter? Let Gazidis explain: “It is important to remember our business goal is to increase revenues for ongoing investment in the team.” That’s very true, so it is pleasing to see some revenue growth in the interims, though as we have seen, much of that is purely down to timing. 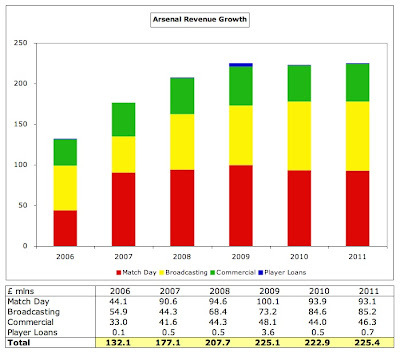 On a full year basis, Arsenal’s only revenue growth since 2009 has come from broadcasting, which rose £12 million from £73 million to £85 million in 2011, as a result of centrally negotiated deals by the Premier League and UEFA (for the Champions League), so Arsenal’s board cannot really take any credit for that. Both of the other revenue categories have declined, most notably match day income from £100 million to £93 million, though this should rise in 2011/12, partly due to the price increase on tickets, partly due to an extra game. Commercial income has also fallen since 2009 by £2 million to £48 million, though there are some signs in the interims of the famous five-year plan beginning to deliver, as this surged 15% (£3.4 million) from £23.1 million to £26.6 million. However, this is still a fairly low return on the substantial investment in the commercial team. As a technical aside, the 2011 revenue of £225.4 million in my analysis above is slightly lower than the £226.8 million used by Deloitte, as they include the joint venture turnover of £2.2 million, but exclude player loans of £0.7 million. So, the TV money was helped by the new three-year Premier League TV deal that commenced in 2010 which meant that Arsenal’s share of the central distribution rose £4 million to £56 million, even though they dropped a place to fourth, which was almost entirely due to the substantial increase in overseas rights. Each club gets an equal share of 50% of the domestic rights (£13.8 million) and 100% of the overseas rights (£17.9 million). However, facility fees (25% of domestic rights) depend on how many times each club is broadcast live with £11.6 million for Arsenal, based on 22 games. Finally, merit payments (25% of domestic rights) are worth £0.8 million per place in the league table, giving £12.9 million to Arsenal. Match day income should increase by around £4 million following the 6.5% increase in ticket prices for the 2011/12 season, but this revenue stream is reaching saturation point, as Arsenal continue to register capacity crowds of 60,000 (the seventh largest in Europe) and their ticket prices are among the highest in the world, though comparisons are difficult, as they include the first seven cup games from European competition and the FA Cup. In 2010/11 this generated £3.3 million a game, lower than the previous season due to a less favourable mix of matches (2 fewer in the Champions League). Nevertheless, total match day income of £93 million was the fourth highest in the Money League, only behind Real Madrid, Manchester United and Barcelona. 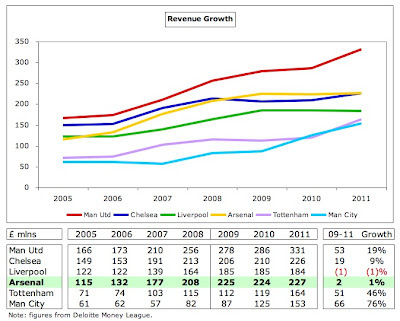 In fact, Arsenal is the only club in the Money League where match day provides the largest proportion of total revenue. Therefore, it was perhaps no great shock that the club announced a price freeze on General Admission season ticket renewals for next season, though the 7,000 Club Level members were not so fortunate, as they have been asked to pay an additional 2%, which is a strange move, as it will only bring in an additional £1 million. Although the club is at pains to emphasise that they have held season ticket prices flat in four of the last six seasons, that is not that powerful a justification, given the high starting point. Given the limited growth potential of match day income and TV revenue from the Premier League (in the short term), it is imperative that Arsenal significantly increase their commercial income, which is extremely low for a club of Arsenal’s stature. In 2010/11, their revenue of £46 million in this category was dwarfed by the likes of Bayern Munich £161 million, Real Madrid £156 million, Barcelona £141 million and Manchester United £103 million. Arsenal’s weakness in this area arises from the fact they had to tie themselves into long-term deals to provide security for the stadium financing, which arguably made sense at the time, but recent deals by other clubs have highlighted how much money Arsenal leave on the table every season. The Emirates deal was worth £90 million, covering 15 years of stadium naming rights (£42 million) running until 2020/21 and 8 years of shirt sponsorship (£48 million) until 2014. Following step-ups the shirt sponsorship deal is worth £5.5 million a season, which compares very unfavourably to the £20 million earned by Liverpool from Standard Chartered, Manchester United from Aon and (reportedly) Manchester City from Etihad. Even Tottenham (one whole season in the Champions League) now earn £12.5 million a season from shirt sponsorship (Auresma £10 million plus Investec £2.5 million). The news is no better with Arsenal’s kit supplier, where the club signed a 7-year deal with Nike until 2011, which was then extended by three years until 2014. This now delivers £8 million a season, compared to the £25 million deal recently announced by Liverpool with Warrior Sports and the £25.4 million paid to Manchester United by Nike. 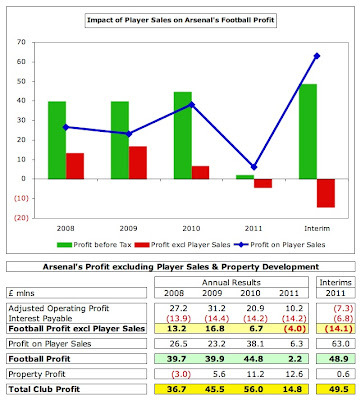 Arsenal have restructured their executive team at great expense, recruiting Tom Fox from the NBA in August 2009 as Commercial Director to “drive long-term commercial success”, though there has been little tangible revenue growth to date. In fairness, it is probably difficult to re-negotiate the principal agreements (though Chelsea did just that with their kit supplier in 2005), but we might have hoped for more secondary sponsors, which has been the main engine behind Manchester United’s commercial growth. As we have seen, there were some encouraging signs in the interims, but there is still a long way to go, as annualised revenue is still only £53 million. Some new sponsors have been signed up recently, including Carlsberg at around £3 million a year and Indesit in a “multi-million” deal. In addition, Citroen extended their deal for a higher sum, while there were new agreements with Thomas Cook, replacing Thompson Sport, and on-line gambling firm Betsson. 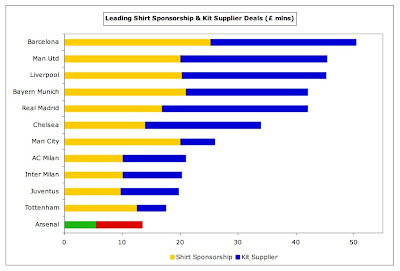 However, Arsenal still have less than half the number of sponsors that partner with Manchester United. Arsenal made their first long-distance pre-season tour in 12 years to Malaysia and China, which helped fill their coffers, but may have adversely impacted the players’ fitness, contributing to the poorest start of the season in living memory. Nevertheless, there are plans to take on even more this summer with a tour of three Asian capitals (Seoul, Beijing and Hong Kong) as well as a trip to Nigeria. On the bright side, when the main sponsorship deals are up for renewal in 2014, Arsenal will have a fantastic opportunity to significantly increase their revenue by up to £30 million per annum. However, here’s the thing: there is a danger that if the team continues to be unsuccessful and maybe even drops out of the Champions League, the club’s bargaining position will be correspondingly weaker. That said, Liverpool have managed to sign superb deals, even though they are in the same boat (though some might argue that they have a stronger brand). There is no doubt that competing in the Champions League can make a big difference, as can be seen by looking at the TV money received by the leading English clubs last season, where the advantage enjoyed by those teams participating in Europe’s flagship tournament is clearly evident. In the past, Gazidis has claimed that Arsenal “have got a really stable model that could not just cope, but do well and compete” if Arsenal do not qualify, while Wenger has said that a season without the Champions League would be a “catastrophe” and a “disaster”, so who’s right? The AST pressed the panic button when they suggested that this would cost the club around £45 million in lost revenue, which might conceivably make them “the first club to fail to meet Financial Fair Play rules.” This would be the height of irony for a club often held up as paragons of virtue by UEFA president Michel Platini. Although the AST said they would provide a detailed assessment of this figure, in fact they only listed £27 million (€30 million) for money paid out by UEFA for participation and prize money (based on the 2010/11 distribution) with the remaining £18 million presumably coming from the “impact on premium seat sales and season tickets”, which would represent virtually a 20% reduction in match day income. That might be unduly pessimistic, especially if Arsenal were to compete in the Europa League, though it would be interesting to see what the club would do to season ticket prices in this eventuality. Admittedly, the prize money for Europe’s junior competition is a lot less, e.g. last season the two English representatives, Manchester City and Liverpool, each earned just €6 million for reaching the last 16, while the highest pay-out was only €9 million. Sharp-eyed observers will have noted that the allocation for the TV pool varies significantly among English clubs (Chelsea €27 million, Manchester United €25.9 million, Arsenal €16.6 million and Tottenham €14.4 million). This is because of the methodology used to allocate this element, whereby: (a) Half depends on the position that the club finished in the previous season’s Premier League with the team coming first receiving 40%, second 30%, third 20% and fourth 10%. 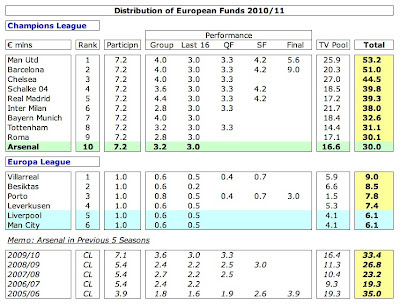 As Arsenal finished third in the 2009/10 Premier League, they received half as much as Chelsea. (b) Half depends on the progress in the current season’s Champions League, which is based on the number of games played. So Arsenal received the least, as they only reached the last 16. In other words, success has a direct impact on the amount of money received. If Arsenal were to qualify for the Champions League by finishing fourth, that would obviously be beneficial, but they would not receive as much as the teams finishing above them. Of course, fourth place has other unhappy implications. Not only is there potential for an awkward qualifying match at an inconvenient stage of the club’s preparation (like Udinese this season), but also there is a suspicion that this will impinge on transfer activity, as the budget might depend on the outcome of that tie. 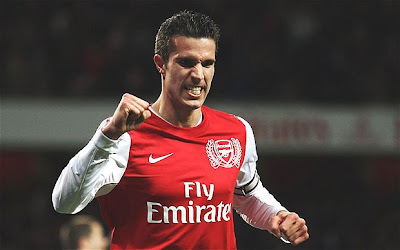 Naturally, the other downside of failure to qualify is that it makes it more difficult to retain players of the calibre of Robin Van Persie and to attract the big names that would make Arsenal genuine challengers for honours. As for Arsenal struggling to meet FFP, that seems very dubious to me. Even if the revenue were to fall by £45 million, this would be accompanied by cost reductions, e.g. hosting games, travel and performance bonuses. There is also plenty of room to manoeuvre in the wage bill, but that may not even be necessary because of the “healthy” costs that UEFA exclude in their break-even calculation. In the 2010/11 annual accounts, this amounted to £38 million, consisting of expenditure on youth development and community (estimated at £10 million and £1 million respectively), interest on the stadium loan (£14 million) and depreciation of tangible assets (£12 million). Once those expenses are added back to the football profit of £2 million (the £13 million profit from property development is also excluded), we have an FFP profit of £40 million, which should be ample to cope with a Champions League shortfall. That said, the annual cost base is likely to increase by around £20 million following the rise in wages and player amortisation, though much of this will be covered by revenue growth (excluding Champions League). On the other hand, 2010/11 had relatively low profit on player sales of £6 million. If this is insufficient, then it should be noted that clubs will be allowed to absorb aggregate losses (“acceptable deviations”) of €45 million (around £38 million), initially over two years for the first monitoring period in 2013/14 and then over three years, as long as they are willing to cover the deficit by making equity contributions. The maximum permitted loss then falls to €30 million from 2015/16 and will be further reduced from 2018/19 (to an unspecified amount). If that is not enough, there is a clause in the small print of the FFP regulations (Annex XI) that allows for the wages of players signed before June 2010 to be excluded from the calculation, assuming their contracts have not been extended after that date, so long as the club is reporting a positive trend in the annual break-even results. This question is partially driven by Arsenal’s parsimony in the transfer market, where they are the only leading club that has been a net seller over the last five years to the tune of £33 million. As Gazidis stated recently, “We’re about creating star players, not about buying them.” Manchester City’s net spend of £431 million is more than the other five clubs combined, but Chelsea have also splashed out £160 million. In comparison, Manchester United, Tottenham and Liverpool have been relatively frugal, though their spend is at least £80 million more than Arsenal. However, Arsenal did spend a fair bit in the summer: £53 million according to Transfer League, including £12 million on Oxlade-Chamberlain, £11 million on Gervinho, £10 million for Arteta, £10 million for Mertesacker and £6 million for Santos. The interims state that the club actually invested £75 million in the acquisition of new players, including “to a lesser extent” improved contracts for some existing players, suggesting either that the fees were higher than reported and/or additional payments were made to agents or to players as loyalty/re-signing fees. In terms of how much money is now available, the noises coming out of the club are a little contradictory. After last summer, Gazidis said, “We deliberately kept some powder dry… There are funds available to invest in a significant way in January and next summer.” He was backed up by the owner, Stan Kroenke, who defended Arsenal’s lack of spending thus, “It wasn’t because the money wasn’t there. We have the money.” However, Wenger said last week that it was not true that he had £50 million available, as estimated by many analysts including the AST and yours truly. That is the amount available in cash, though to an extent that is not really meaningful, as most transfers are funded via stage payments, e.g. Arsenal are currently owed £19 million by other clubs, but in turn owe others £23 million, so all the transfer money is not needed upfront. Furthermore, Arsenal’s strong balance sheet would allow them to take on some additional debt, especially as this could be supported by the cash still to come from property development. 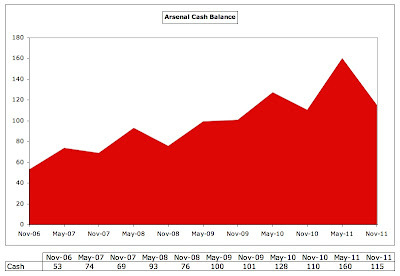 Some may be concerned that Arsenal’s cash balances have fallen £45 million from £160 million to £115 million in the last six months, but that is partly because of the seasonal nature of cash flows during the year, e.g. the balance is invariably higher in May than November, due to the influx of season ticket money. A more pertinent comparison would be November 2010, when the cash balance was £110 million. In other words, the underlying trend remains upwards. The other point that people often raise when discussing the transfer fund is that it would also have to fund a new signing’s wages, so if the club bought a player for £25 million on a five-year contract at £100,000 a week, that would represent a commitment of £50 million. That is undoubtedly true, but it is a little disingenuous, as it ignores the fact that this would be at least partially offset by the departure of an existing player, not least because of the limitations imposed by the rules on squad size and non-homegrown players. When we talk about the transfer policy, that effectively also covers the wages policy, for these are two sides of the same coin at Arsenal with Wenger controlling an overall budget for transfers and wages. In particular, Wenger has admitted that Arsenal cannot afford to follow a policy that involves both high transfers and high wages. This is important, as Arsenal’s wage bill is one of the highest in the country at £124 million, though it is a fair way below Manchester City £174 million, Chelsea £168 million and Manchester United £153 million. Note: given the performance-related bonus payments included in United’s figure, the fundamental difference is much smaller. On this basis, Arsenal’s performance in regularly finishing third or fourth in the Premier League could be considered slightly better than par for the course. Some might point out at this stage that Tottenham are ahead of Arsenal in the league, even though their wage bill is £30 million smaller, but this is only one season – and it hasn’t finished yet. 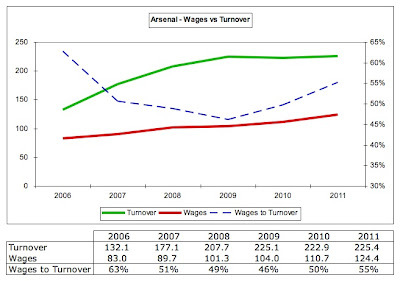 The pressure to compete is obvious by the deterioration in Arsenal’s wage to turnover ratio from 46% in 2009 to 55% in 2011. Although this is still one of the best in the Premier League, it is the logical result of flat revenue and 20% growth in wages. There is also little sign of this trend ending any time soon with the £8 million increase in wages reported in the interims. On an annualised basis, that implies a wage bill of around £140 million for 2011/12. There are clearly issues with Arsenal’s equitable wage structure, which means that the best players like Robin Van Persie are not particularly well remunerated (by modern standards), while fringe players like Abou Diaby, Marouane Chamakh and Manuel Almunia are handsomely rewarded for their efforts. This was epitomised recently by Johan Djourou’s new £50,000 a week contract, which seemed more in recognition of his frequent interviews with Arsenal.com than his defensive ability. Not only does this policy reduce the money available to attract world-class players, but it also makes it difficult to move on under-performers, hence loans for Bendtner and Denilson. While there is some logic in giving youngsters good contracts, as it prevents other clubs from snapping them up for free, it is questionable whether this has worked out for Arsenal, given the relatively small number of success stories. My hope would be that one of Arsenal’s smart executives is conducting a review of whether this approach is the most appropriate in 2012. Given that Arsenal have been so profitable for so long, it begs the question what the club has done with all that lovely cash - £389 million from operating activities in the last six years. Looking at the cash flow statement, it is clear that very little has been spent on bringing in new players with net player registrations of just £14 million. Following the elimination of the property debt, the only outstanding debt is effectively the “mortgage” on the Emirates Stadium. At the 2011 year-end, this was represented by gross debt of £258 million comprising long-term bonds and debentures. In the last six months, this has been reduced by another £6 million, while net debt has risen by £39 million from £98 million to £137 million, almost entirely due to the £45 million reduction in cash discussed above. So what’s the conclusion on Arsenal’s finances? I guess this partly depends on whether you’re a “glass half full” or “glass half empty” type of person. There’s no doubt that Arsenal’s sustainable model has much to be admired, though it is not without some challenges, especially around growing (commercial) revenue and controlling wages growth. In particular, it is vital that more secondary sponsorships deals are signed before the main agreements are re-negotiated in 2014, when Arsenal’s financials could soar. In spite of these issues, many fans still wish that the board would push the boat out a little more. After all, there is a middle ground between spending like it’s going out of fashion and hoarding cash for a rainy day. 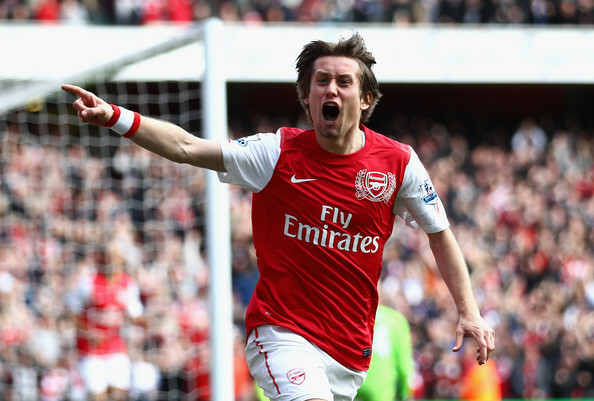 Looked at another way, it is worth asking whether Arsenal can afford not to spend. As Gazidis admitted, the club is “not where we want to be.” If they end up failing to qualify for the Champions League, then their prudent approach might be fairly described as a false economy. This is by no stretch of imagination a club in crisis, but it is clear that a club as wealthy as Arsenal should be doing better. Then, to paraphrase Morrissey, every day might be like Sunday. Another superb analysis thanks for this ! No, though it is possible that Arsenal are subsidising the wages of some of the players out on loan. I believe, the best investment Arsenal can make now and in the next 2 seasons is to win a title + keep appearing in the CL. That would maximise the potential sponsorship deals they could bring in once the current ones expire. I might be too naive but is it not possible to call up the current sponsors to renegotiate and improve the running contracts to get a fairer deal? Perhaps its even possible to buy out the current deals in favour of newer, more lucrative deals. For all the talk of Arsenal being a well managed club, I fear the poor efficiency of the business development side of the club is far worse than their performances this season. If you put all your money on making a healthy profit, then its inexcusable that you fail to deliver on it while crucial gaps in the first team squad go unfilled. 1. Paying high value contracts to players like Bendtner, Squillaci, Diaby(!) leaving very little room for high wage earners. 2. Lack of pay for performance - Very little pay is performance unlike Manchester United. 3. High risk aversion - Always saving for a rainy day. A great player even outside our budget could make all the difference in terms of on field performance & hence on the financials. However we prefer to err too much on the side of caution. Juan Mata being a prime example. Thank you for this revealing analysis Swiss Rambler. To answer the question in the mind of thousands of gooners - who is to blame for the lack of investment in the playing squad would you say that Arsenal's financial situation makes it necessary to sell players before buying? 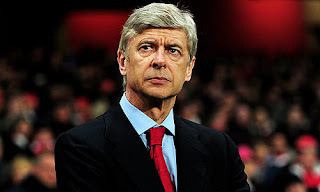 In essence, is Wenger greatly constrained in his ability to spend say even 20-30 million net a season on transfers and would you say its the management which expects him to do so? That's a very difficult question to answer. As I wrote, there are quite a few contradictory statements coming out of the club. I think that there's definitely cash there to fund transfer fees, but the club needs to offload some players in order that the wage bill does not explode. I think its being unstated that the club will not want to spend big until at least 2014 (when it can renegotiate a lot of its deals), or at most till the stadium is paid off. After that we'll start spending very big for sure, after all that was one of the major reasons for the move. But i really doubt we're going to spend crazy this summer, because we've already spent so much on the ox, mertesacker, santos, arteta. i think the signing of the summer realistically is going to be the re-signing of van persie, and using all our "transfer kitty" on his contract. I think 2014 is dead wrong. A year or two leading into a new shirt deal, or any other major commercial agreements, we want the club to be top of the table, deep into the CL, and winning domestic trophies. Waiting until after those deals to spend money will weaken the long term commercial income.....a place we have been for far too long. We have basically maxed game day revenue, successful runs will bump up broadcasting cash, and commercial income needs to be the final anchor lifted. Fantastic blog, thanks for taking the time to write it. I also read the Chelsea results published two weeks ago. I compared the two results and it seems to me that we @ Arsenal consciously make an effort balance our books. Also, regarding the TV rights - are they issued in same manner in all leagues i.e. based on the position they finished in the league. I think that's unfair. What would happen if all the teams get equal % share in TV rights? Would'nt it help Arsenal in making those extra million pounds and ultimately invest for team building? Should'nt FA intervene and relook at this policy if its going to help PL in long run? You make 99.99999% of other blogs look like utter shite, and your clearly sound financial analysis makes a mockery of the AST's witch hunt. Yes, I think the AST are a group to be avoided, they don't have the best interests of anyone at heart. Because of the stadium deals our sponsorship money is too low. Consequently our income is heavily reliant on spectator income. We need to renegotiate because the pips are already sqeaking and on the terraces there is a lot of talk of people giving up. Fascinating and insightful, I actually feel more relaxed about our club now. One of the sources of fan frustration and anger must be the club's cloak of secrecy on financial matters (and attendances!). It seems we are a club still prudently building, if we can continue to finish in the top 4 (third would be nice) for a few more seasons I think we should all be happy with this. Who knows when the sugar daddys will get bored of their toys? And if chelsea have shown anything this season it's that player and manager investment doesnt always guarantee results, trophies and titles. I'm curious about the impact of the Financial Fair Play project. Can UEFA truly deliver anything remotely approaching an even playing field for all clubs? If so you have to think that this is going to be to Arsenal's advantage in the medium to long term. Man Utd's debt seems mountainous but they have proven it's manageable (for now). Chelsea and City will surely have to dramatically change their models. Liverpool appear to have missed their window to build a new stadium before taking on massive debt at the wrong time. Great analysis Swiss and should be applauded by all intelligent gooners who are interested in how our beloved club is run. As always, a wonderfully written blog post. I'm not entirely sure if the website can be categorised as a 'blog' as you're articles are quite mainstream and an absolute joy to read. Brilliant work, and thank you for investing so much of your time in this. This is an excellent read -- valuable insight and very good 'big picture' incorporation. This is my first time on your blog and will undoubtedly, not be my last. Insightful read as always Swiss. The changes at board level should be subject to further scrutiny. Only Friar and the ever clever Hill-Wood remain of the original members of the board prior to the development and completion of the Emirates. What effect have the turmoil inside the club had on performances on and off the pitch? I think it's highly unlikely that Kroenke will make any outrageous sums available to Wenger as his other sporting brands seem to indicate that he'll continue to follow the "Arsenal way" blueprint we've seen thus far. There's a recurring theme in these annual reports and that is that the club's commercial income remains stagnant year-on-year. I hope we are as busy off the pitch as the players were on it on Sunday. Otherwise we'll likely see a fight for a CL spot as the primary objective as opposed to fighting for major honors until 2014 and even that may be the best we can hope for if we lose Arsene and don't find a capable manager with masochistic tendencies. In between ever more gaudy footballers and ostentatious club owners your posts truly adds value to my football following. Great blog. Thank You. "YOUR THE ONE FOR ME...err... SWISSY !...." Excellent analysis of the numbers. Good news that we can anticipate some significant additional Commercial revenues from 2014 onwards. In the short term the club leadership should be severely pruning the wages and numbers of journeymen squad players so that we can reward our top players and buy in some more quality. I Think that it's very impressive that arsenal get such poor value for the enormous amount of money they spend on wages. It is testament to Arsene's desire to make everyone feel like they are part of the family that he gives everyone a contract of at least between £40 and £50K a week. And because he wants to show to them that love means forever, only rosicky almunia and fabianski are out of contract in the summer. Arsenal just have so many players in their squad that are effectively useless to them, and are sucking 2-3 million out of the club every year. Arshavin, squillachi, bendtner, chamakh, Park, denilson, diaby, vela mannone and Djourou. 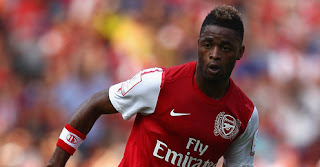 Someone should have had a word with wenger about giving djourou a new contract. That was an act of madness. I think that that is a shocking indictment of the way that Arsene wenger has operated in the transfer market and constructed his squad. Even then you have to have serious doubts about the quality of a number of the players he signed in the summer. Gervinho seems to be completely brainless on the pitch, andre santos and mertesacker have looked far from comfortable, and park has sunk without trace. I suppose that ultimately all good things come to an end, and with van persie probably leaving, I think it will probably be for the best if Arsene heads off, to allow someone to clean up the enormous, expensive mess that he has created. Great analysis. However I think there might be more to Wenger's comment regarding needing to make a £15m profit than you presented. You report £153m four year profit and £111m in interest payments over that same period. If you take the difference (£42m) and add it to the base year 2009 cash balance (£76.8m), the sum (£118.8m) is remarkably similar to the current reported cash balance (£115m). What this means to me is that the Arsenal "business model" doesn't budget for repayment of the long term bond debt out of operating income. The club is basically operating exactly at break even and the debt payments are basically being funded out of profits generated wholly from the clubs rapidly declining inventory of property and player sales. This may be considered "responsible" for a football club, but it seems the opposite from where I sit. And I believe that this is the basis for Wenger's comment about needing to generate £15m annual profit. But that leaves one to wonder what the goal of this plan is? My best guess is that they hope to survive just until they can renegotiate the shirt sponsorship, which I assume they hope to generate the entire bond payment. It is not an unreasonable expectation considering that Spurs reportedly receive £12.5m annually from their shirt sponsor. However, once all operating expenses are covered by commercial revenue, what happens then? If present trends continue, the club will arrive at equilibrium completely shorn of talent and in desperate need of reinforcements, however the only mechanism for player investment would essentially be more player sales, further weakening the side. Could you do a historic piece on why Seria A collapsed and whether there are lessons for the EPL to learn. Arsenal's wage bills might be lower in coming seasons as many senior players who were on high wages are on their way out. Plus FFP should bring some sanity back in the market. If the club can stay in the Champions League this season, a turnaround is on the cards. Excellent read, really wonderful analysis of the facts and figures that even financial philistines like myself can appreciate! So a question for your expertise- what's the solution to the wage inflation that is in danger of crippling Arsenal, even if it is all of their own making? Every potential new signing that comes in must look at the wages the likes of Diaby, Almunia, Denilson etc are on and think "Well I must be worth at least that and more!". Simply shipping those players out, no doubt at a discounted rate to offset the wage drop they're inevitably going to have to take, won't change the fact that they were being paid way over the top, and that established players who potentially come in will demand to be compensated similarly. Is the only solution to shop for cheaper alternatives and kids which, essentially, is what we're already doing, and not having much success with? Is there a more inventive solution??? One item you didn't touch on is the 'Other Costs' of £55 million. 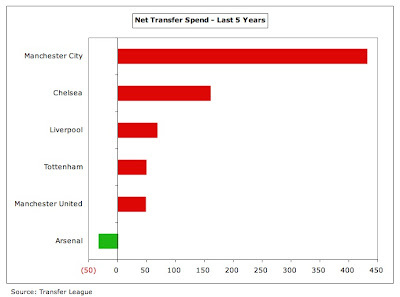 This seems very high, and the lack of transparency would indicate Arsenal have something to hide. Could it be profit share bonuses? How does this compare to other clubs accounts, are they as disguised as my club? In short, Arsenal's Other Costs are on the high side, but around the same level as Manchester United and Chelsea. Excellent analysis and helps to highlight what an appalling job Wenger has done with contract negotiations - he had this supposedly laudable philosophy that there should be little difference between what average squad players get and what the best (Marquee) players get. Look at Man Utd diff between Rooney & Evans is £180k a week our equivalent is RVP and Djourou only 40k a week it defies belief and Wenger has a lot to answer for. It was highlighted in here and is becoming well known we cant now get rid of the Bendtners, Almunias, Fabianskis, Denilsons, Arshavins, Djourous, Chamakhs, Velas, Squilaccis of this world because no one else is prepared to pay them the stupidly high wages Wenger has burdened our club with and someone needs to bring him to book for it. Board were also at fault for letting this philosophy proliferate. I would also like an analysis done of the wages being paid to non playing staff like this "highly paid commercial team" also Gazidis and Wenger himself. In my view Wengers salary (currently £7m) should be renogotiated to half that with him earning the rest based on winning trophies. Same for Gazidis current £1.7m drop it to £500k with bonuses for team success not profits. Finally is it possible to ascertain how much extra revenue would be gleaned if we won the Premiership and champions league - the prize money is significant as is the extra TV revenue and the value and bonuses from sponsorship & advertising deals - in other words what I am suggesting Gazidis is concentrate on having a team that wins trophies and you will find the rest takes care of itself - just try it !!! I'm not sure "the rest" does "take care of itself". Doesn't your proposal just provide an incentive to buy short-term success without any regard to long-term sustainability? Reeks of pre-2008 Wall Street or The City. Like North Bank Ned, I don't think that it's quite that simple, but I absolutely accept the point that success on the pitch equates directly to more prize money and indirectly to better commercial deals. 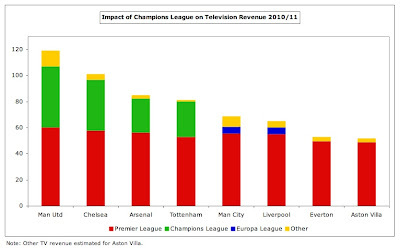 You can estimate the size of the prize by looking at the graphs on PL and CL revenue distribution. Great work as always! Surely the buck for the underperformance of Tom Fox stops with Gazidis? If we fail to clinch CL qualification, and lose 40-45 million as a consequence, the knives will be out for Wenger on account of signing dross like Chamakh,Almunia or Park and offering contract extensions to the likes of Djourou. I have no issue with that, but how the hell are people like Gazidis and Fox still in a job after losing the club that amount every year? Excellent analysis of the P&L and balance sheet, as ever. One question: How much is known about the wage structure at the leading clubs, both in the EPL and the main European leagues? Do you have information about the range of wages paid, and the balance between basic and performance-based pay? It would make fascinating reading if you do. Unfortunately not, as English clubs very rarely report this level of detail. There are some analyses around featuring individual player wages, though these can only be based on "informed estimates." So, it seems the mystery dance is nothing more than a safety dance? There's an assumption behind these writings, that the only way to compete for trophies, is to buy world class players. This troubles me in two ways: Firstly, it does not put faith in Wenger's plan about building, not buying, a team. And if we do not respect this plan, it seems fairer to ask him to leave rather than to force him into acting against his nature/will. Secondly, Swiss Rambler shows we can not expect to win battles for the best players in the world, so what is left, really, than to show faith in a group of youngsters breaking through together? Ah, yes, but I prefer Elvis Costello to Men Without Hats. The thing that irks me so much is average players getting wages they do not even remotely deserve... or even youth players. The club needs to sort that out. Just think of the cash they're basically throwing away! What would happen if all the teams get equal % share in TV rights? Would'nt it help Arsenal in making those extra million pounds and ultimately invest for team building? Should'nt FA hollister and relook at this policy if its going to help PL in long run? You do it again! Great work mate! Fantastic & informed piece. Thank you. And I thought I could read it in my lunch hour! As a qualified accountant myself, I take my hat off to you. You have carefully constructed your report in such a way that non-accountants will have been able to fully understand the implications and relationship between Arsenal's turnover, profit and cashflow and their impact on the club's financial decision making, and breathed some clarity into the troubled rumours and myths surrounding the club and its financial acumen. Thanks very much for that. I do try very hard to make the numbers accessible to non-accountants, so comments like this are very gratifying. Thank you for yet another insightful article. Sadly the conclusion seems to be that Arsenal's prospects offer little for hope but much for continued concern. I suppose the most useful insight is that the loss of champions league participation would not have necessarily have an immediate disastrous financial impact but an unknown impact on reputational issues (for player and sponsorship appeals -- the false economy you speak of). The opening statement of an annual report to Arsenal should say something to the effect that we have invested in the future with a new stadium and facilities and have accepted that until debt is brought to more manageable levels and better sponsorship deals brought in then a title and significant cups are out of our reach. This reality yet again emphasises the achievement of Wenger to manage to keep Arsenal competitive. There is however one very concerning issue with regard to Wenger's investment in players. As has been noted promising young players were secured on long term lucrative deals as a means of keeping a stable and potentially successful squad together in lean spending times (a feat which almost came to incredible fruition in the 2007-08 campaign and last year's in particular). However many of these players have wholly failed to live up to billing and the faith placed in them, what is even more concerning is the purchase of a player like Park (or Chamak, or as I suspect Miyaichi who far from having demonstrated he belongs in the EPL). The man was deemed good enough to be bought from Monaco (and at the same time damaging relations with Lille the other bidder -- which may impact any actual desire Arsenal may have had to sign Hazard). However he's been inexistent, one of three conclusions, (i) wenger completely failed to assess the player properly (ii) the player experienced an incredible and instantaneous drop in ability and form or (iii) the board is pushing the purchase of players for marketing purposes despite aptitude. The last of these is a truly concerning issue if there is any truth to it. Indeed there may be truth in it, Arsenal is surely compensating for the lack of competitive commercial revenue from sponsorship with the asian/international pre-season tours. I for one will keep a peaceful eye on the next two seasons and hope that the bounty of frugality will pay big dividends in 2014-2015. Excellent analysis. The commercial deals look poor value with the benefit of hindsight - hopefully this will be corrected next time around. the wages structure is fair for all but the risk is that underperformers are difficult to move on - perhaps a larger element of pay could be performance related in the latter stages of a contract? I'm a little confused in regard to the stadium debt. Do we still owe over 250million as of right now? How much are we paying a season? When will be done with that? Right now, Arsenal owe just over £250m for stadium debt, which will be paid off over 20 years. It's costing around £20m per annum in interest and capital repayments. First and foremost, brilliant analysis. You make it easier for amateurs to understand what is happening behind the scenes. 250m over 20 yrs would mean 12.5m a yr. If we are paying 20m a yr including interests and capital repayments, we'll be paying a total of 400m at the end of 20 yrs. What am I missing here? I went through your analysis again but couldn't answer it myself. It'd be nice if you could clarify. Thanks. I believe that Arsenal is short-sightedly focusing on the easily measurable areas of the business at the expense of the harder to measure, but ultimately more lucrative, areas. For example, if they refuse to pay big transfer fees they hold down costs and boost profitability in the short term, but the absence of star players and trophies means the brand weakens and the commercial revenues suffer. Oh, and one more thought: Djourou at 50K/week is about the worst piece of business I've ever heard of. Didn't the club offer Ashley Cole 55K before he left? I'm sure Cole is regretting that move. I can't give enough commendation to your efforts to digest extensive financial information about football and present it, in massive detail, in layman's terms. I, for one, have had my understanding of football finance overhauled by reading your blog. 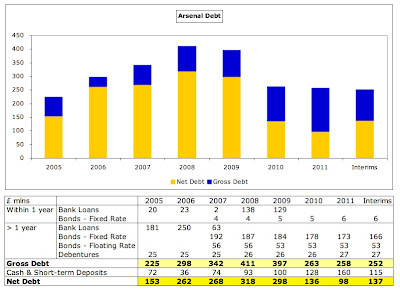 One thing I'm curious about, however, is your comments on Arsenal's debt. You've said in this article, and previous posts about Arsenal, that Arsenal is now in no hurry to pay off its debt: it only has the long-term stadium bonds left; it's unlikely to pay them off ahead of schedule; and it would likely face penalties for trying to clear them. Under this assumption, it seems Arsenal is breaking even so long as it budgets for the £14m a year in interest payments, and doesn't need to make any further profits. As such, you estimated in this post and your last one that Arsenal has ~£50m in surplus money to spend. Indeed, it seems, as far back as March 2010, you calculated that Arsenal would have sizable transfer budgets available. Obviously, since then, Arsenal have been making profits above and beyond what was needed to clear the short-term debt and cover their interest payments. What strikes me, however, is that this surely (feel free to correct me if I'm mistaken) neglects the importance of net debt, does it not? While Arsenal may indeed have the freedom to spend their surplusses, now that that money is no longer earmarked for debt obligations, would it not be more beneficial to the club in the long-term to use it to offset their stadium bonds? They may not be able to lose their gross debt obligations of ~250m, but can they not at least offset the 14m interest payments through interest payments made on their own surplus assets? Can they not raise the £250m early, and use it to produce interest offsetting the ~£90m in total interest payments until the last of the bonds expire in 2020? Not only does it achieve this, but it means the club needs to raise no further finance in the future when the bonds expire and need to be paid off. These seem sufficient benefits for reducing net debt to zero early, even while gross debt remains at £250m. While the austere financing required to do this obviously hurts the club in the short term, it means that, in every year after net debt is cleared, the club shall have more resources to make use of. As far as I can tell, you don't seem to have discussed the possibility of the club's decided to continue austere budgetting, even though it looks like the path the club is currently taking, and it seems to have tangible long-term benefits. Have I missed something here? At the moment, the club seems to have made remarkable progress to eliminating its net debt. Although the mid-year slump in cash balances means net debt has currently risen, it seems that, by the summer, this year's hefy profits shall leave the net debt reduced from £98m in 2011 to ~£50m (which may be negligible if you exclude the £30m in everlasting debentures and include the soon-to-be booked profits from Queensland road). When the club appears so close to eliminating its net debt, surely the frequent calls for it to spend its surplusses on the pitch are misguided? Too look at Arsenal's current trophy-droubt optimistically, when the club history of this period is written, this period may be seen as a 'decade of debt' whose negative repurcussions end when the stadium-necessitated inferior commercial deals expire in 2014. While the club may have been able to achieve more during the decade, if only it had spent more, the subsequent period, in which its resultant resources shall be so much greater, shall surely make the austerity worth it? If Arsenal had stayed at Highbury and thereby avoided interest on the Emirates' debt repayments and poor commercial contracts would the club have more or less money today? 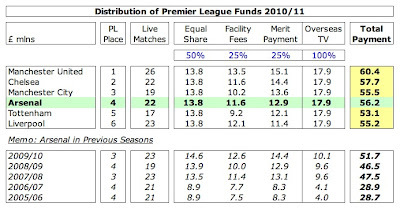 Liverpool and Chelsea both have similar incomes without moving to new stadia. Judging by the table on matchday income above, the extra seats (and corporate boxes) bring in an extra £1-2m per game, depending on how much is down to high ticket prices. Even at a conservative £1m, the extra income from home games is more than enough to compensate for the interest payments. Additionally, the extra seats will keep making money once the debt is paid off, leaving us in a much better position then. By then, of course, Liverpool will probably have moved to a larger stadium, but they'll be in the "paying off" phase. One question: does the "matchday income" figure include things like programmes, beer and snacks? What about all the business the club shop gets? Question 4 was “what is the impact of Arsenal failing to qualify for the champions league?” I can’t see you answered that one. 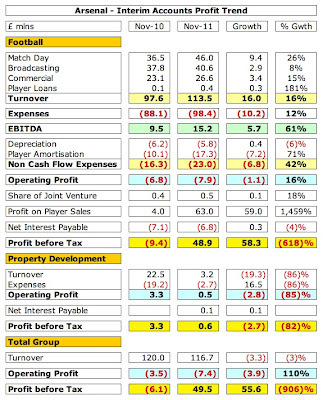 You did calculate what you think the FFP adjusted pbt of the club used to be in 2010/11 but I can’t see how that answers the question as its out of date and doesn’t consider the impact on revenues of not just missing out on UCL prize money but UCL matchday revenue and sponsorship payments linked to UCL performance and of the wider impact on matchday, TV and commercial revenue of having a team that is outside the top 4. Surely your starting point should be 2011/2 football pbt before gains from player sales? Player sales are the likely reaction of the manager to managing the financial problem posed by failing to qualify. Outside of raising equity finance, player sales are the only real tool open to get cash in and costs down, it is the solution to a problem you’ve not fully quantified. On that basis, rather than starting at a football pbt of £4m you should probably start at the football loss before player sales of £2m in 2010/11. You should then add the increase in the wage bill (minimum £15m) and amortisation charge (£12m) being seen in 2011/2 if the half year results are extrapolated for a full year. From that we can deduct revenue gains over the year as a whole (some commercial income, maybe £5m if the first half is extrapolated) and some extra matchday revenue from one extra carling cup game and the 4% ticket price rises less no league cup final and reduced EPL merit and appearance fees (say £9m in total for revenue). That’s a £20m football loss to which one must add the potential loss of revenues in 2012/3. You then have some scale to the potential problem facing Arsenal and the losses that need funding from free cash, residual property assets or player sales. Remember that Arsenal need to ideally keep their best players, add more quality to the team and improve on the pitch performances to recapture a top 4 spot whilst managing this problem. Sure there’s perceived as being a lot of slack in the enormous size of the playing squad and wage bill but balancing all these factors and delivering a team capable of justifying a top four spot over the next two to three years will require a markedly improved performance. Quite frankly, it’s a bit rich that the AST censures me for lack of detail here when your own statement, despite describing it as a "detailed assessment”, only quantifies one item, namely the £27m that would be lost in UEFA’s participation and prize money. 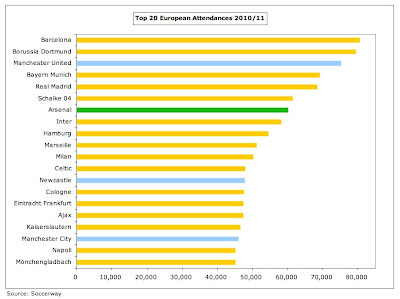 Ironically, that figure is taken from the 2010/11 season, which in my piece you criticise for being out of date. Yes, the costs will increase in 2011/12, which I did mention in my narrative, though this is not always as simple as annualising (doubling) the growth reported in the Interims. 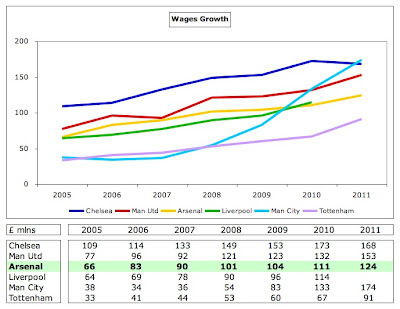 I would agree that the growth in wages is likely to be £15m, but player amortisation is not quite so straightforward. For example, in the previous interims, this fell by £3m, which would imply an annual reduction of £6m, but in fact the full year decrease was only £3m. As you say, some of this increase in the cost base will be covered by revenue growth, but you then strangely ignore the financial impact of one of your principal themes, namely profit on player sales, which will be at least £57m higher in 2011/12 than 2010/11. Granted, that is not necessarily how you would want the club to make money, but that is a done deal. That will provide some breathing space for FFP’s first monitoring period, which covers the two accounting years 2011/12 and 2012/13. You have also not mentioned the impact on the cost base of Arsenal failing to qualify for the Champions League, which would mean lower costs for inter alia staging home games, travel to away games and performance bonuses. Furthermore, you have once again ignored the adjustments allowed by FFP for excluded costs (nearing £40m), acceptable deviations and salaries of players signed before June 2010 (the latter for the first two monitoring periods). This should tide Arsenal over (at least in terms of FFP) until the cavalry arrive in the form of higher commercial deals in 2014, when we can expect an uplift of around £30m per annum. 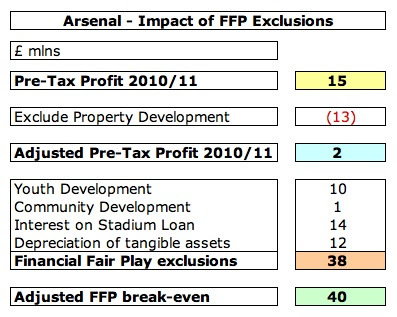 I don’t disagree that failure to qualify for the CL would have a substantial impact on Arsenal’s cash flow (I described this as the “real world” in today’s Arsecast), but I’m struggling to see how this would cause the club to fail to meet FFP. There's no doubt that Arsenal face a lot more challenges in the next couple of years than the headline profit figures would suggest (that was sort of the point of the article). However, there is a sizable cash pile available, even after taking into consideration factors such as seasonality and the debt service reserve, which should be boosted by more cash from property development. It is indeed a tricky balance, but that's why the club has a highly paid executive management team. Right? I don't disagree that with the 2011/2 transfer profits in the bag passing the FFP test isn't going to be an issue until that year drops out of the monitoring period. My point is that getting an improved team performance whilst having to reduce levels of investment in the squad in terms of wages and player purchases to balance the books is going to be very hard and something I can't recall other clubs achieving. The club rejected a call for a rights issue in 2009 and the concern remains that we may continue losing our best players, that really was what I am saying. As to my comment, I'm not censuring anyone, I'm merely emphasising that the hole being faced is somewhat larger than 2010/11's results initimated. If you ever want to ask questions or challenge please do contact us as we don't always go into the explanatory detail you do in a blog on a short release to members. OK, but the first FFP monitoring period where 2011/12 drops out is 2015/16, which will include 2014/15, where the main sponsorship deals should have significantly increased after they have been renegotiated in June 2014. I do share your concerns about this tricky balance and would not be averse to more cash being injected into the club either via a rights issue or a loan from Kroenke. I actually wanted to include a section on some possible actions here, but decided to exclude it, as the piece was already of epic proportions. I am on the whole supportive of the AST's objectives and have had many discussions with Tim about the financials. That said, I think that the comments around FFP were unnecessarily misleading and were certainly taken out of context by some in the media. 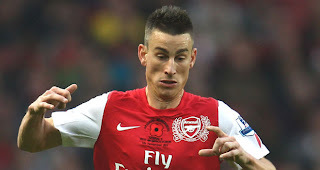 Is there any truth in rumours that Arsenal have a large potential tax bill due to use of EBT's? I've heard it suggested that the current HMRC vs Rangers case could provide the precedent which would free the Revenue to launch cases against a number of top flight English clubs. Cheers - loving your work. Do you have any plans to examine Rangers in the future? I would love to see an neutral [l assume] examine their financials, although audited accounts may be a long time coming. I think that you're right about the Rangers case being a precedent for actions against some English clubs, but my understanding is that Arsenal have already settled with HMRC a few years ago. I've had loads of requests to look at Rangers, but there are a couple of problems: (a) the story changes on an almost daily basis; (b) as you say, the most recent accounts are not available. There was the usual breathtaking arrogance in Simon's post that we have come to expect from some members of the AST who take themselves too seriously. Their analysis of Arsenal being in danger of falling foul of FFP on the back of not qualifying for the CL for a season was a whole lot of hogwash. I thought that RM owed all their money to various banks. Hilariously they annoyed Barca fans by borrowing lots of dosh from a Barcelonan bank relatively recently. You are a great analyst man, Thanks for your all fantastic blogs. Benfica is on the verge of renegotiating the broadcasting rights, and is considering broadcasting them on its own channel (that already exists). It has already turned down 22M€ a season from the company that holds the righs today. If that were to happen it would be the first time for a european clube, no? I hope you'll do an analysis of Benfica's finances after they release their data for the 11/12 season. What an amazing article. This answered many of my questions about Arsenal that the Guardian has hinted at, but didn't apply enough column space to deal with properly. Thanks. I read your blog for long months nos, and it is so entertaining. I also promote it to friends supporting orner clubs. Last example, an Hearts supporter, who himself forwarded it to other supporters. Congratulations. Now one point and one question. In France there is also the debate about wages being too high, especially mediocre placers. So the clubs are trying to implement schemes based on performance and results, the variable part being more important. Like it is being done in other industries.... My own pay slip shows it! Do you know whether this is being applied in AFC? And in other EPL clubs? The question: being based in Switzerland, are you following the news about the Swiss League? And the recent stories of bankrupted clubs? If yes, would it be possible you write an article about Servette FC? Or about the economy of Swiss football? Tanks again for your marvellous blog, from a fan of football, of AFC and of Servette FC. Interesting post as always, however I do have to query one part of your analysis. You put Arsenal fans in the 'long suffering' category, I can think of many fans who would take seven years without a trophy as normal service rather than long suffering!!!! This is indeed an insightful posting as always. And the opinion remains. 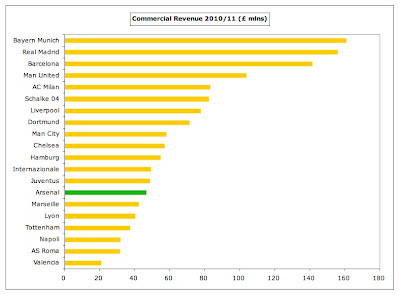 The Arsenal board messed it up on the commercial revenue front. Yes, we needed the money for the stadium at the time. But the club should have had the foresight to not lock down the revenue stream in such a pathetic manner with a long-term deal. Or they should have done what Chelsea did with Umbro back in 2005. I am not sure if such as thing was even mentioned in the contracts, but we should be able to re-negotiate the price or cancel it altogether with a pay-back. That extra 20-25 million quid each season could have meant SO much. Who knows, maybe it could have been an answer to Arsenal's defensive problems, in the form of a truly world class player. And hence maybe, it could have lead us to a title. Anyway, I am man of prudence and patience. 2014 is not far away. It would be a fairy tale uprising for Arsenal if we were to pen lucrative sponsorship deals, buy world class players, retain the stars they have and hopefully see the desired effects the FFP rules in other clubs. This is the most comprehensive review of Arsenal's business model....Good one! !